“Let’s see what we got,” Jess said. She led me out of the bar and through a pair of swinging doors into the back of The Chap, a restaurant on the outskirts of Brainerd down County Road 3. The kitchen glowed bright and alive. 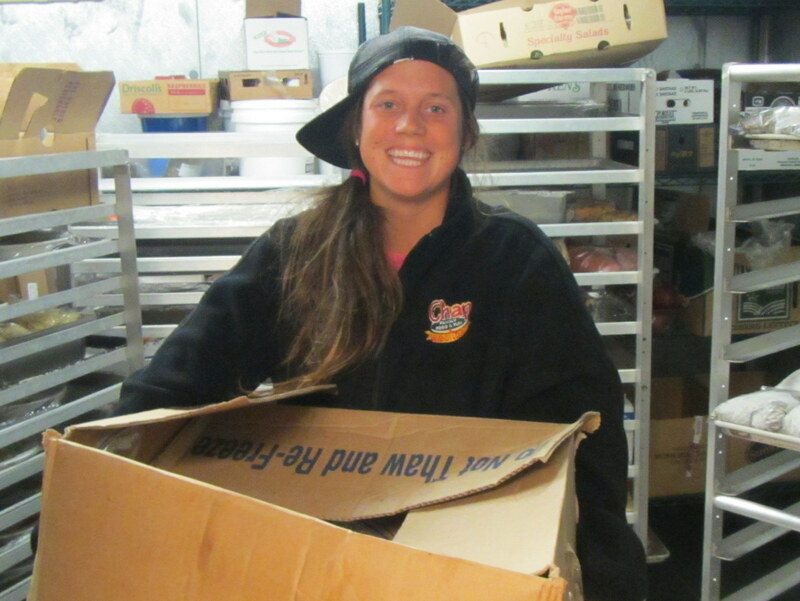 Her dad moved from one spot to the next, opening bins and chopping fruit, as he prepped food for the day. He smiled and waved us past a wall of ovens, grills, and fryers to the refrigerator’s large silver door. Jess threw it open and we walked inside. For someone who’d been eating macaroni and cheese for a days, it felt a bit like walking into a bank’s vault with an empty wallet. Cinnamon buns and pans of lasagna hung in racks. Blocks of cheese and boxes of fresh fruit lined shelves next to bags of carrots and broccoli. A tray of chicken waited for the oven along with a platter of wild rice. I’ve resupplied in strange places before–small gas stations, a barrel of extra food someone had left, a post office in the middle of nowhere–but I’ve never even been inside a restaurant’s freezer before and certainly not with a box and an invitation to fill my kayak with whatever I wanted. I hesitated, not sure what to do, so Jess started piling things in for me. “That should get you a bit of the way to Minneapolis,” she said. Her dad came by to grab something and check our progress. Jess shot him a look. “Dad, it’s a kayak,” she said. “What if we froze it solid?” he asked. I shook my head and he looked deflated, like he wished he could do more, like opening up the restaurant’s freezer and handing me an empty box was something anyone would do for a stranger. He sighed and went back to the kitchen to continue prepping for the day, but somehow a bag of fresh-baked cookies found their way into the box before I left, stuffed full of chocolate with a crisp edge and soft middle. They’d keep for days, even in a kayak, until I ate the last one, returned to macaroni and cheese and dreams of the freezer in the back of The Chap. Posted in Angle to Key WestTagged AKW October, Angle to Key West, brainerd, chaps, cinnamon buns, freezer, mississippi river, resupplyBookmark the permalink. Dan — When I did my long distance bike ride to Maine in June, this is exactly what we encountered — people opening their homes, restaurants, wallets to help in anyway they could. While those individuals couldn’t go with you/me, they felt by contributing something, anything, they would feel like they accomplished something. I had a lady give us $2 on the side of the road one day in South Carolina while another got up at 5 a.m. so she could ride just 4 miles with us one day as we approached the ferry into New York City. It’s people like those at this restaurant which make us want to do more and more because they are givers as well. Keep it going man. Love reading my daily exerpts. Thank You Jess, Jess’ Dad and The Chap!!! I can’t wait to visit. Through Daniel’s blog people in Florida are now thinking of wintering in Minnesota given the gracious and giving quality of Minnesotans like you. I do question your sanity in opening your freezer to Daniel in one of his epic journeys. I once saw him and three other long distance hikers almost buy out everything at a local grocery store and devour it within the hour. Again, thank you for making everyone’s day who reads this blog so much brighter.